[UPDATE: Thanks to Soren & Xeni for the link-lovin'. I'm in the process of moving my blog from Typepad to Wordpress, so's I can take more control of the look&feel of my writings, and I'm dual-posting here and at the new joint Sips from the Firehose. Nobody directly involved will admit it, but this is looking more and more like one of the more nasty, yet brilliant, scams of the last couple years. It may have been pulled off by the legendary Nigerian internet scammers, but it's beginning to look like it may have been the work of a vast leftwing conspiracy with a twisted sense of humor. 1. 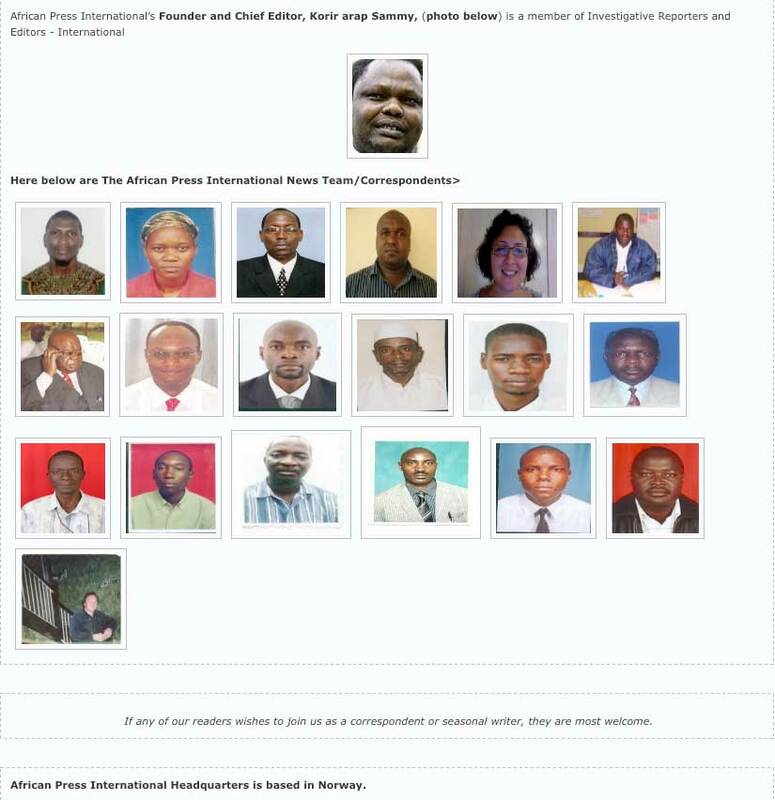 A Wordpress website claiming to be the creation of the African Press International, and NGO somehow associated with the Rainbow Foundation - OK, already I know this is a lot to process - claimed that they had a tape of Michelle Obama admitting that Barack Obama was not an U.S. citizen, and thus not eligible to be president. 2. Nobody seemed to notice that the API's headquarters are in Norway. 3. In the weeks leading up to the election, as John McCain's campaign was trailing smoke and in a steep vertical dive (to use an Air Force-appropriate metaphor), a ragtag bunch of deranged Obama-haters his desperate supporters seized on this story as a last-minute chance to save the U.S. from an Obama presidency, which they had come to believe would be some horrible combination of Stalinist Russia, the Taliban and a San Francisco gay bathhouse, circa 1978. 4. The overheated right-wing blog echo chamber started to scream and yell about the tapes, hoping to spark an uproar. 5. The API started getting erratic in its pronouncements about the tapes, on the one hand demanding money, on the other alleging mysterious dark conspiracies that were preventing the release of the tapes, conspiracies involving shadowy pro-Obama forces. 5. Still believing that these tapes existed, the right-wing blogs started collecting money from their readers to buy the tapes. Dirty Harry suggests a benefactor can offer $100,000. that if the goods are delivered the blogosphere can contribute $20,000. ones that just got fired. Or will get fired in the next couple of weeks. 6. The scam mutated into an allegation that the LA Times had some kind of tape that would once and for all, destroy the Obama campaign, but that it was withholding the tape because of the aforementioned vast left-wing conspiracy to hand the country over to Obama. 7. The bidding for the tape reached $150,000. In a move sure to be familiar to anyone who has studied the history of "The Spanish Prisoner," the price for releasing the tape suddenly escalated to $2 million. 8. At this point, you'd think that the people who initially believed in the existence of this tape would start smelling a rat. You'd be wrong. A blogger named "Mountain Sage" started cataloging all the inconsistencies of this story, and if you're really interested in all the ins & outs of this, please go there. 9. I'll save you a whole bunch of mental consternation & possible suicidal impulses stemming from despair over the human condition, and cut to what I hope is the end of this story: the Wordpress blog has been taken down, and the right-wing blogosphere has moved on (mostly) to its next alleged revelations of Obama conspiracies that will exterminate all mankind. If your head is still spinning a little bit from all this, take a minute and look at some LOLcats or something. Now then. How is all this relevant to the usual subject around here - New Media, newspapers, journalism? Well, as we debate migrating from the traditional media to a future where all our information comes at us over the Great Big Internet Pipe, I think it's instructive to recognize that offloading some of the news-gathering & editing duties to the audience (i.e. crowdsourcing, Citizen Journalism, etc. ), is not a process entirely free of risk. Stories like this one were once confined to the utter fringes of our national conversation. Back when I first started working for newspapers, I learned that at least once a week, we'd get a long, somewhat smelly, letter from the local lunatic, ranting & raving about Zionist Occupation Government ("ZOG") reading his mind with CIA laser beams. The single-spaced typewritten screeds were usually augmented by scrawling in red pen around the margins, in big circles. I've since learned that writing in big spirals is one of the warning signs of paranoid-schizophrenia, and in this case, of a person who has stopped taking their meds and is hearing the voices & acting on their instructions. Unfortunately, as we open up the doors of the media to a more collaborative conversation between reader & journalist, fanatical factions are more easily able to hijack the national discourse, and divert us over into areas that are meaningless, pointless and an utter waste of time. Some would say that that has always been the case - that even in the traditional media's heyday, we had stupid stories that for one reason or another, rose to the level where we were talking about them because everyone else was talking about them. And yeah, I know that one of the benefits of the web is that the audience no longer just sits and passively accepts that the information being fed to them is true. That the Citizen Journalists are willing & able to step in to do research to expose fraudsters. That has certainly been the case here. But this scam was, well, childish and poorly organized. A guy in Norway claiming to run an African news agency making wild claims? Already the red flags were waving. However, if a much more well-funded and intelligent organization were to set out to concoct a Big Lie, and to use the low barriers to entry that the web offers to storylines, memes, etc., to deceive the public ... how would we know? And if this organization were smart enough, and good enough at using SEO and other tools to bury and discredit its critics and their objections, what then? Thanks for the compliment. However, I'm not sure if a link-exchange is the best strategy here. While I'm all for building a web-based business, I think your content strategy and the way you're apparently "scraping" content to fill out your blogs is not a good fit. Terrific article. I'm a bad person for hoping a lot of stupid people were separated from their money. I reckon they'll continue to milk this until the inauguration if they can. If you go to my blog and look at the top you will see I have a page entitled the API Saga. It encapsulates all of the relevant posts onto one page. Mentistfugit: Gads. I'm not sure if I'm deeply disturbed or somewhat in awe of the fact that the API just won't give in. Sage: All props to you for your work on this (bows, murmurs reverently). Great work posting this - thanks. There's a significant error in need of correcting, however. Yes - the weird Norwegian Nigerians press agency scam occurred largely as you stated. Over time it just got weirder and weirder. If you take the time to read all of their posts in the month leasing up to the election there are many more insane subplots afoot - including an incident where crazed Obama supporters in Norway set fire to their offices or something. At the same time as the wacky API tape story gaining steam in the wingnut blogosphere, there was ANOTHER story about ANOTHER tape that conservatives wanted released. It was this OTHER tape that the conservative bloggers were collecting funds for - not the API tape. The API tape was supposed to have been a recording of a phone call made by an angry Michelle Obama to the headquarters of API in Norway. The OTHER tape was a tape that the LA Times had been supplied by a confidential source. This tape was a videotape of a going away dinner for a [university] colleague of Barack Obama's, last-name Khalidi. Go back and read the stories. In the Ace of Spades and Crazy Pamela Atlas Shrugs posts that you linked to, they are explicitly talking about the LATimes/Khalidi tape - not the API tape. In the Ace of Spades and Crazy Pamela Atlas Shrugs posts that you linked to, they are explicitly talking about the LATimes/Khalidi tape - not the API tape. Yikes! Too many seekrit weapon tapes to keep track of ... I think I was not alone in conflating the API tape with the LA Times tape with the Michelle Obama "whitey" tape from June (http://www.noquarterusa.net/blog/2008/05/31/breaking-news-michelle%E2%80%99s-whitey-problem-thread-2/) with godknows what else. Which, of course, is central to my point. Please forgive me for the error - just trudging through the convoluted history of what was said by whom about what in this tangled skein of lies made my eyes glaze over. Very well written, very good summing-up. I've marvelled at the people who wanted it to be true so badly. US Consumers = Monkeys on Crack It's like operant conditioning. If you don't give the monkey the shock, it won't stop pushing the lever that used to deliver it hits of cocaine. Well, the government has been working overtime to try to stave off that shock. Which is all well & good - nobody likes getting high-voltage shocks - but my concern is that if we don't in some way start changing our mindless consumerist behavior, the eventual shock is going to be much, much worse than what we've got coming in the next year or so, if we just stand & take our medicine.